to have their moment in the spotlight. 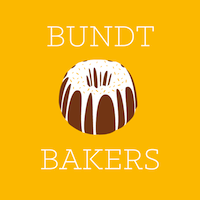 This month the Bundt Bakers are being super creative and incorporating breakfast cereals into their bundt cakes. What a way to make cake an acceptable option for breakfast - just grab a slice and go. Actually, if Starbucks were smart, they would jump on this idea immediately. A latte and a slice of cake and you are set. 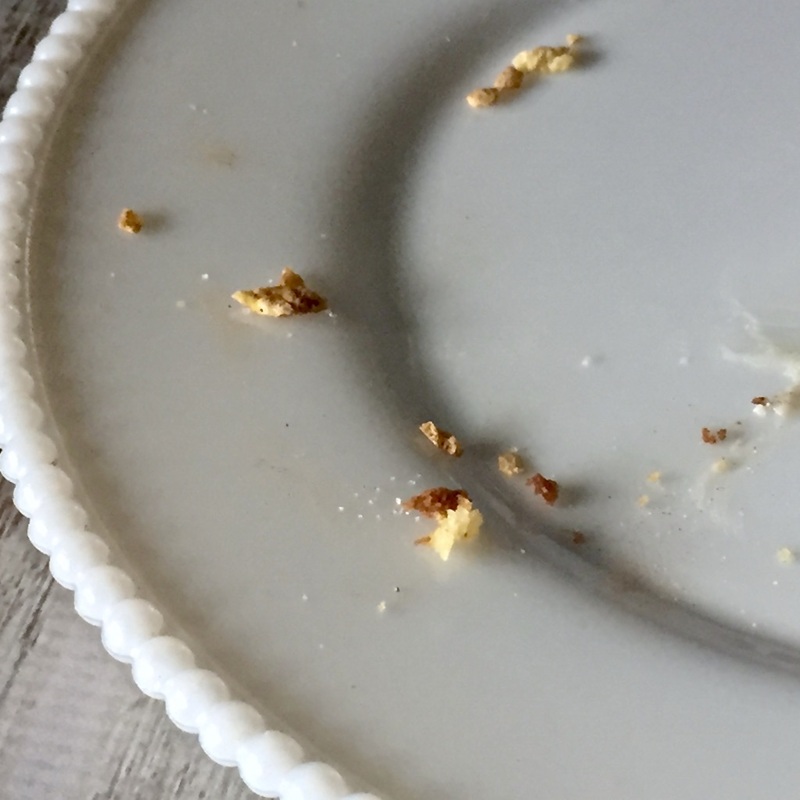 Cinnamon Frosted Flakes are perfect for the cinnamon lover in your family as they actually baked the cinnamon into every flake’s vanilla frosting rather than just dusting over it the top. 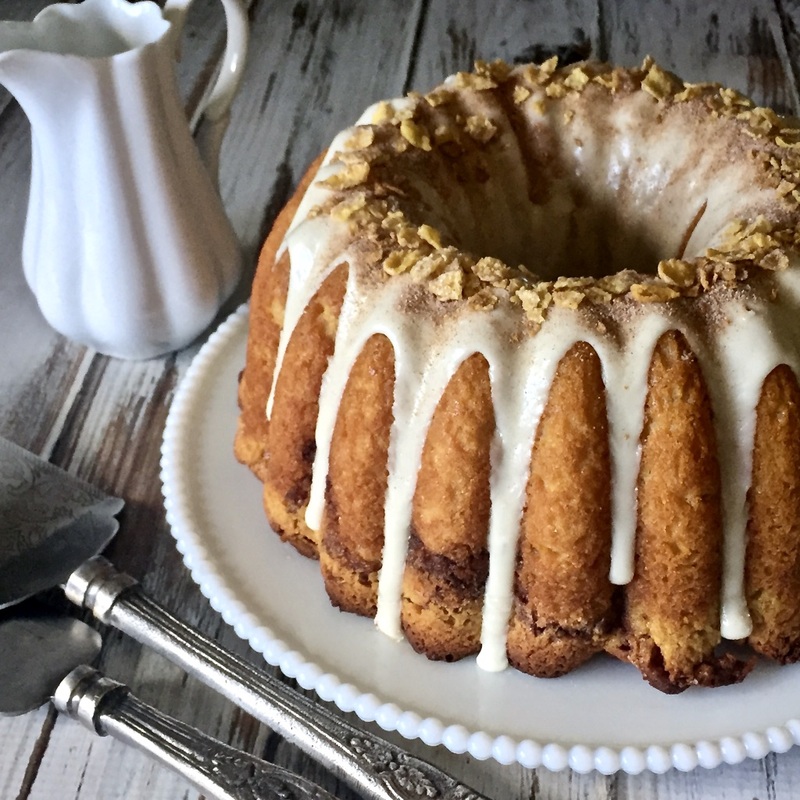 These flakes add an amazing flavor to a bundt cake. They were used not only in the batter, but also in the cinnamon ribbons that run through the bundt as well as on top of the bundt for a little added crunch. As I may have mentioned before I am not opposed to using a boxed cake mix. They have saved my life many a time when one of my girls came to me just before bedtime and told me that they forgot that there was a bake sale at school the next day. There is a reason that The Cake Mix Doctor series of books became bestsellers. And in the case of this bundt, a boxed mix means that you can have a delicious cake in record time. 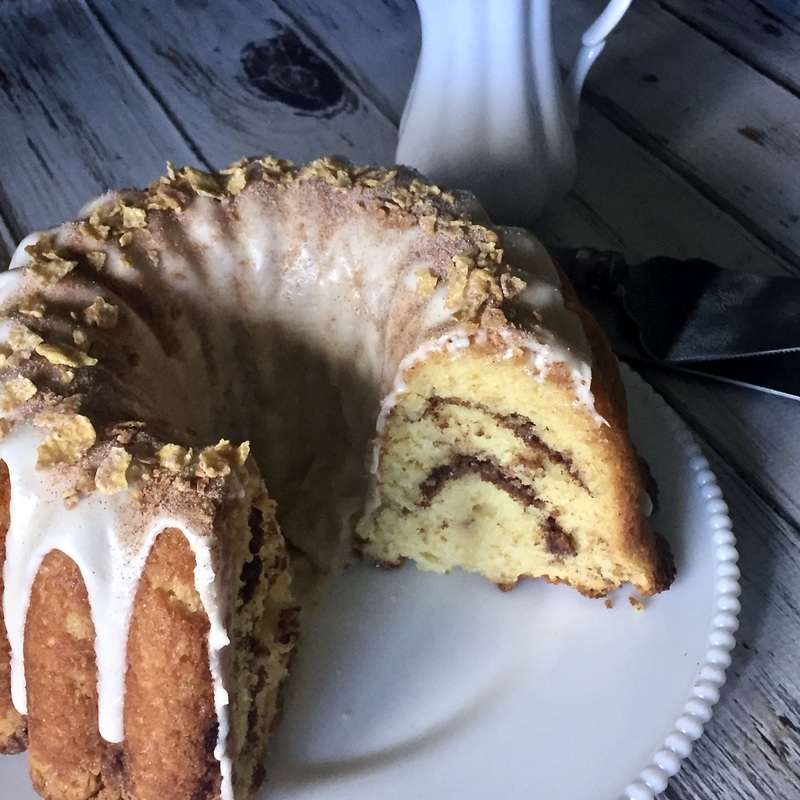 I used a combination of finely crushed Cinnamon Frosted Flakes cereal in the batter and hand-crushed cereal in the swirl that runs through the cake, as well as on top of the icing on the bundt as crunchy decoration. Talk about a flavor bombe. Everyone loved it - long live Breakfast Cereal Bundt Cakes! If you would like to know more about the Bundt Bakers and see what the other bakers made for the Breakfast Cereal Bundt Cake theme please scroll down below the recipe. In a small bowl whisk together the white sugar and cinnamon. Add the crushed cereal and stir until fully combined; set aside. Preheat oven to 180℃ (350℉) and spray bundt pan well. In a large bowl combine cake mix, vanilla pudding mix, greek yogurt, vegetable oil, eggs, and warm water and mix well with hand mixer. Stir in crushed cinnamon toast crunch cereal. Pour ⅓ of the cake batter into the pan. Sprinkle half of the cinnamon swirl mixture on top of the batter. 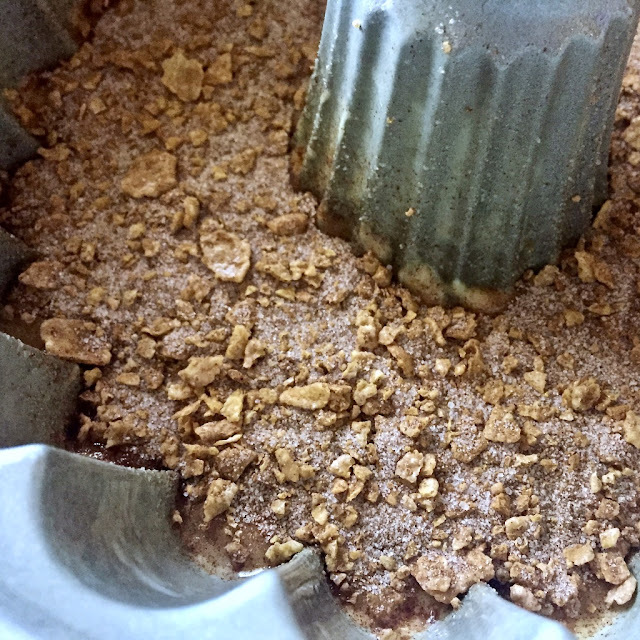 Next, spread another ⅓ of the batter on top of the cinnamon swirl mixture, using a spatula to smooth it out. Sprinkle remaining cinnamon sugar on top of the batter, then top with the last ⅓ of the batter. Bake for 45-50 minutes until an inserted cake tester comes out clean. 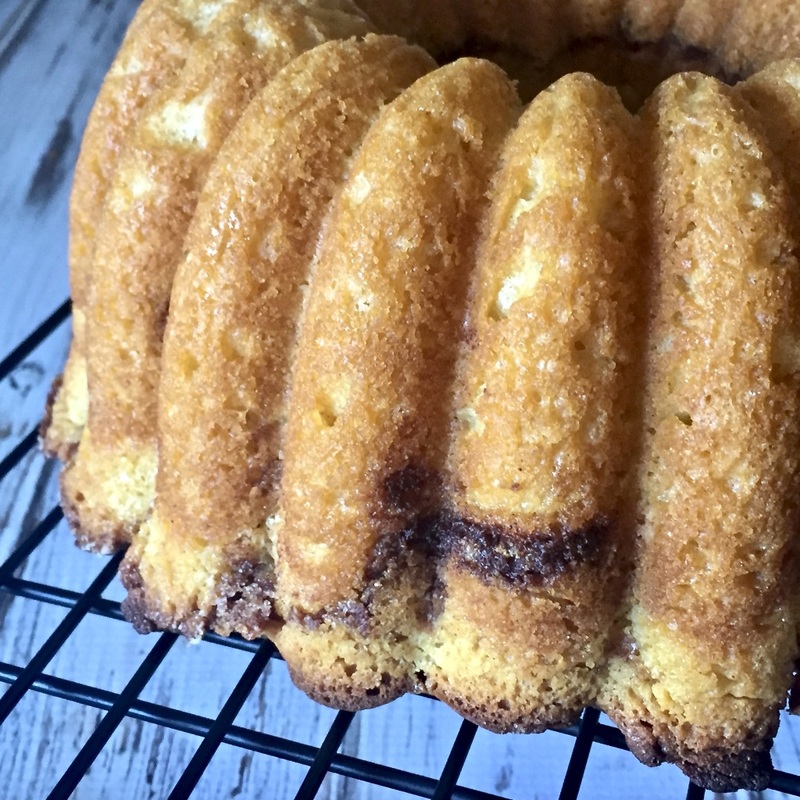 Allow to cool for at least 30 minutes before turning cake out onto a cooling rack to completely cool. Mix together cream cheese, vanilla, and powdered sugar. Add milk 1 tablespoon at a time until a pourable consistency is reached. Drizzle over cake, then top with cinnamon toast crunch cereal if desired. Store in airtight container at room temperature until ready to serve. This is such a creative theme, Felice. Hats off to you! I love your double swirl of cinnamon and that crunchy topping as well. 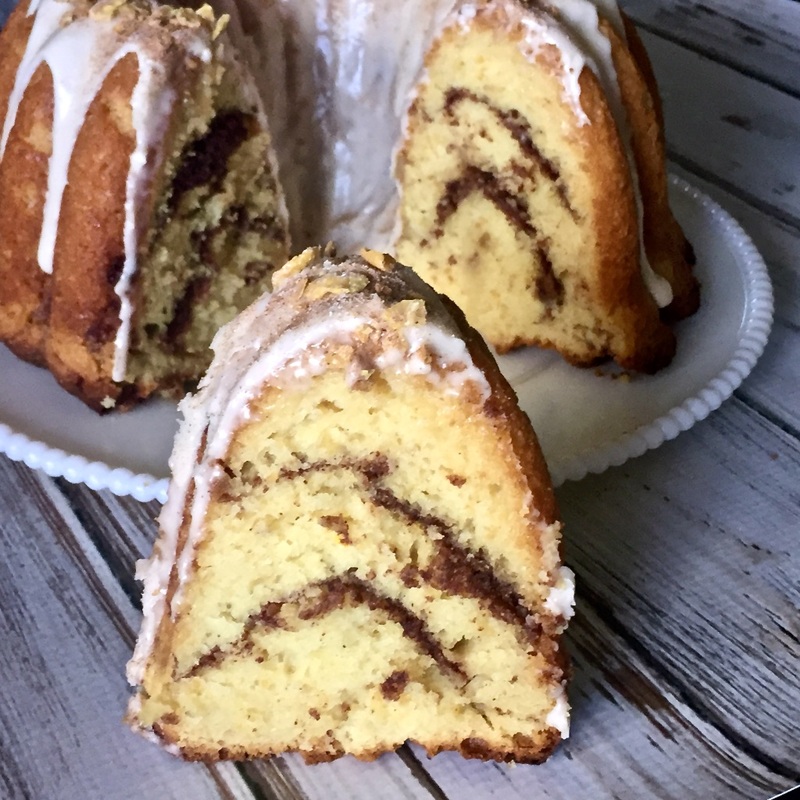 Love that swirl in your bundt. I'm drooling. You had me at cinnamon ribbons. This is one good looking cake and those Cinnamon Frosted Flakes have been put to very good use.